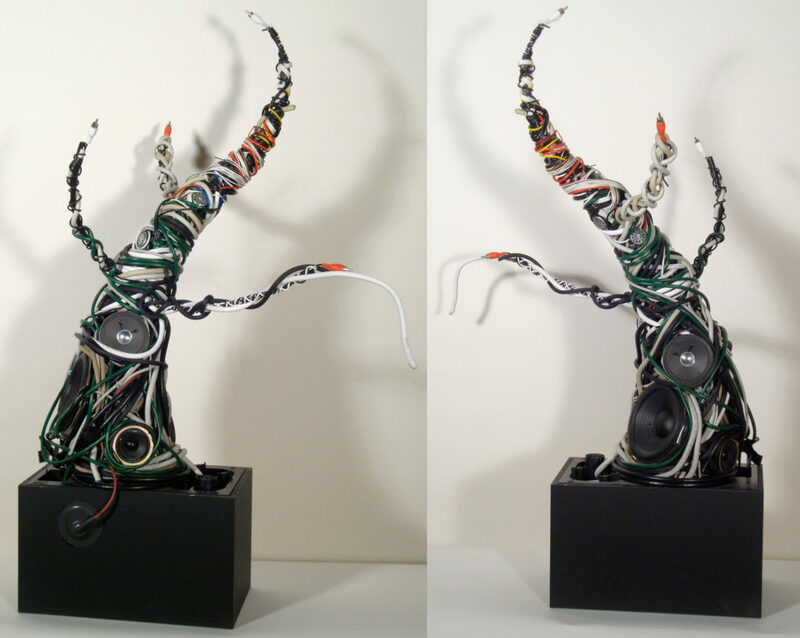 The Bonsai project is an ongoing experiment in sculptural recycling. Murmur is an electronic tree that blossoms with sound rather than flowers. It disperses its sonic pollen over an area just wide enough that beings with ears (i.e. humans) will absorb the sounds. Once a whisper, mutter, or murmur reaches our ears, it burrows deep into the recesses of our brains and stays there, ready to grow into pure inspiration. After all, Murmur grew from pure inspiration–it’s part of this tree’s life cycle. Thus far, there is only one Bonsai, and that is Murmur, however there are plans for another two using different materials. The speakers are all functional and play music that I arranged with sounds from the Freesound Project. In the Fall of 2011, this piece was displayed in the All Student Exhibition in the Slusser Gallery in the Art and Design Building of the University of Michigan. It also won an award during this exhibition. This piece was subsequently in the 2013 exhibition Sonorous, in the Robbins Gallery.